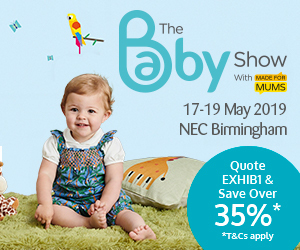 The Baby Show Birmingham is a three-day event taking place from 17-19 May 2019 at the NEC, Birmingham. This is a unique family-friendly event for parents-to-be, new parents, grandparents, babies and toddlers! We will be on stand B61 with lot’s of goodies to give away! This code is valid for online bookings until midnight, Thursday 16th May 2019.